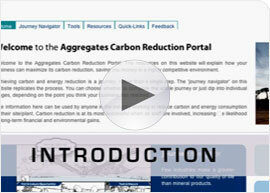 Welcome to the Aggregates Carbon Reduction Portal. The resources on this website will explain how your business can maximize its carbon reduction, saving you money in a highly competitive environment. Achieving carbon and energy reduction is a journey, rather than a single step. The 'journey navigator' on this website replicates the process. You can choose whether to complete the whole journey or just dip into individual stages, depending on the point you think your business has reached. 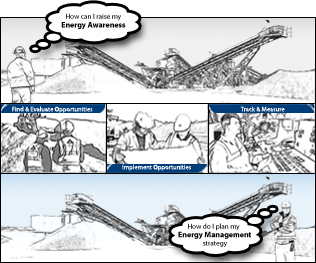 The information here can be used by anyone in the industry seeking to reduce carbon and energy consumption at their site/plant. Carbon reduction is at its most successful when all staff are involved, increasing the likelihood of long-term financial and environmental gains. The carbon reduction content has been created by The Carbon Trust as part of its delivery of support to the Aggregates industry . This has been funded via the Aggregates Levy Sustainability Fund (ALSF). The Carbon Trust is a not-for-profit company providing specialist support to help businesses and the public sector boost business returns by cutting carbon emissions, saving energy and commercialising low carbon technologies. For further information please see the Quick Links section. Click anywhere on this image or the 'Start Journey' button below to start your carbon reduction journey.